The focus of this summer school will be to appreciate how physics and philosophy interact to contribute to our understanding of the nature of time. Our goal is to bring together scholars from both areas to consider central aspects of time as they arise in various physical theories, as well as how traditional philosophical questions regarding time may both motivate physical theorizing and find themselves constrained by it. In particular, we shall consider what statistical physics, the special and general theories of relativity, quantum mechanics, and recent developments in quantum gravity imply for our understanding of (space and) time. The relevant scientific theories consider, among many other topics, the physics of motion, the nature of the continuum, and the geometry of flat and curved spaces. 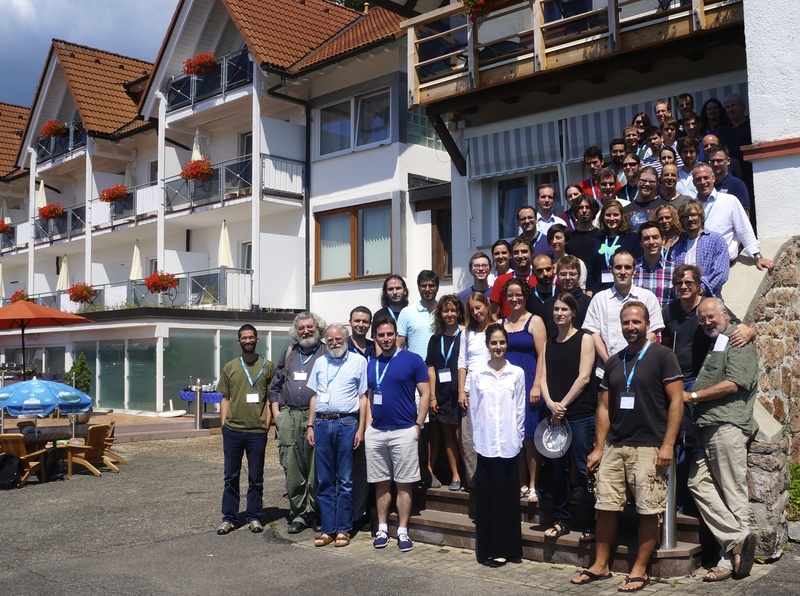 Although the summer school will also consider more straightforwardly philosophical issues, the primary focus will be on the foundations of spacetime as the philosophy of physics is concerned with. Nearest airport: Basel (or Frankfurt or Zurich), then take the train to Freiburg (Breisgau) Hbf, after that the train to Titisee or Neustadt (Schwarzwald). From there take the local bus service (Bus 7257) to Saig Ochsen, Lenzkirch which is the final destination. Train tickets are available on bahn.de. The application deadline was 1 April. On 22 July a workshop on The Metaphysics of Time will take place in Lausanne. There will be a collective travel from Lausanne to the summer school on 23 July. Please book your accomodation in Lausanne and train tickets individually. For your stay in Lausanne we recommend the Hotel des Voyageurs. From 29-31 July the Foundations of Physics conference will take place in Munich. Please book your train tickets to Munich individually if you want to visit this conference. Train tickets can be booked on bahn.de. For all practical issues, please contact Mario.Hubert@unil.ch. 20:00 Sheldon Goldstein What is Quantum Theory? 09:00 Detlef Dürr What is and Why is Wheeler-Feynman Electro-Magnetism of Interest? Just before the afternoon sessions start on Wednesday every participant can choose to join one of the following groups. One can attend a group for the whole time or switch between groups during the week according to one's interests. The afternoon groups start their work directly after lunch at 14:00. It depends on the group's choice to continue their work after the coffee break at 16:00. The work in this group serves a double purpose: On the one hand, it seeks to provide participants with the necessary background knowledge about EPR-type phenomena in order to understand the tension between quantum mechanics and special relativity. On the other hand, it gives those participants who already have that background knowledge the opportunity to explore some further issues concerning proposals to reconcile quantum non-locality with the space-time structure given by special relativity. Tim Maudlin's book "Quantum Non-Locality & Relativity" (3rd edition, 2011) serves as a basis for our discussions. The choice of chapters will depend on the preferences and the previous knowledge of the participants: For those with little previous knowledge on the topic, chapters 1-3 are highly recommended. Further discussions will be concerned with (parts of) chapters 4, 5, 7 and 10. After introducing the main steps of the standard quantization procedure of general relativity, we'll address the central conceptual and technical challenges that the notion spacetime faces within this 'conservative' approach to quantum gravity. In particular, we'll distinguish the general relativistic challenges from the quantum ones. We'll discuss to what extent spacetime can be absent from the fundamental ontology of quantum gravity. N. Huggett and C. Wüthrich (2013): Emergent spacetime and empirical (in)coherence. Studies in History and Philosophy of Modern Physics 44. V. Lam and M. Esfeld (2013): A dilemma for the emergence of spacetime in canonical quantum gravity. Studies in History and Philosophy of Modern Physics 44. J. Butterfield and C. Isham (2001): Spacetime and the philosophical challenge of quantum gravity. In C. Callender and N. Huggett (eds. ), Physics Meets Philosophy at the Planck Scale, Cambridge: Cambridge University Press, 33-89. Time permitting, we'll make the link with the general debate on the 'primitive ontology' conception according to which the ontology of quantum theory is best understood in terms of ' localized stuff in spacetime' (or 'local beables'). V. Allori (2013): Primitive Ontology and the Structure of Fundamental Physical Theories. In A. Ney and D. Albert (eds. ), The Wave Function: Essays on the Metaphysics of Quantum Mechanics, Oxford: Oxford University Press, 58-75. A. Ney and K. Philipps (2013), 'Does an Adequate Physical Theory Demand a Primitive Ontology', Philosophy of Science 80: 454-474. The nature of space-time in general relativity is distinctly different not only from its role in pre-relativistic physics but also in special relativity. Working our way through the nature of space-time played in Newtonian physics and special relativity we will try to develop an understanding of the role of space-time in general relativity. To this end we will briefly review general relativity in a very geometric way, clarifying the different levels of structure that enter into the basic concepts of the theory. Depending on the background of the participants we will, time permitting, move on to discuss the ADM formalism, casting general relativity in a form that provides a picture of space-time closer to everyday experience. Subsequently we will come to solutions of Einstein's equations containing closed time-like curves, like the famous Gödel universes, and discuss possible implications. A minimum understanding of basic differential geometry is helpful. Kurt Gödel: "A Remark about the Relationship between Relativity Theory and Idealistic Philosophy", and Einstein's reply to this article (in P.A. Schilpp, Albert Einstein Philosopher-Scientist, Volume VII in the Library of Living Philosophers). "Time Travel and Modern Physics"
We'll discuss the metaphysics of causation, with special attention to preemption. We'll also talk about counterfactual dependence and the metaphysics of the temporal arrow in relation to its role in counterfactual dependence as well as the causally productive forward evolution of the world. Paul, L. A. and Hall, N. Causation: a User's Guide. Chapters 1-3 and 6. Why do we find systems – and ultimately our universe – in such unlikely, ordered states in the first place? How can we justify our believe that the universe was even more ordered in the past than it is today? And to what extent can the thermodynamic arrow really account for the difference between “future” and “past” that is so fundamental to our experience of physical reality? The workgroup will start with a discussion of the physical basis of entropy and the second law, working its way to addressing the deeper questions just mentioned. Goldstein, S.: "Boltzmann’s Approach to Statistical Mechanics"
(all articles are easy to find via google). Penrose, R.: "The Emperor’s New Mind", Chapter 7. Reichenbach, H: "The Direction of Time". Do electromagnetic fields physically exist? What does classical electrodynamics tell us about causality? Lange, M. (2002). An Introduction to the Philosophy of Physics – Locality, Fields, Energy, and Mass. Chapters 1-3 and 5-6. If possible, please, take this book with you.